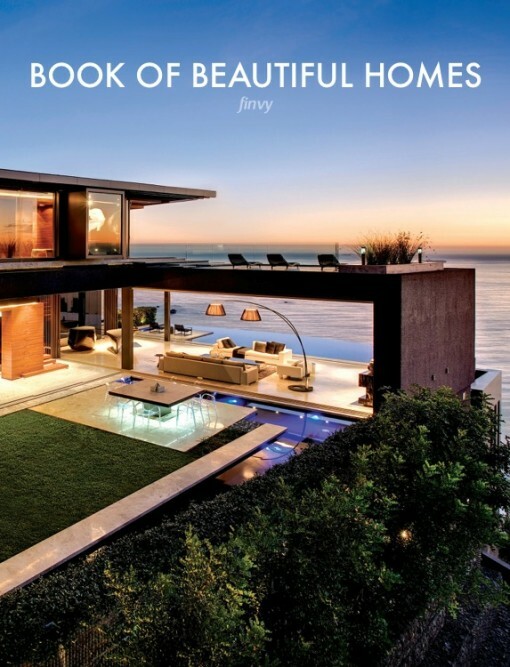 150 square meters of reinforced concrete forms the structure for a high-end residence, designed by M Architects. 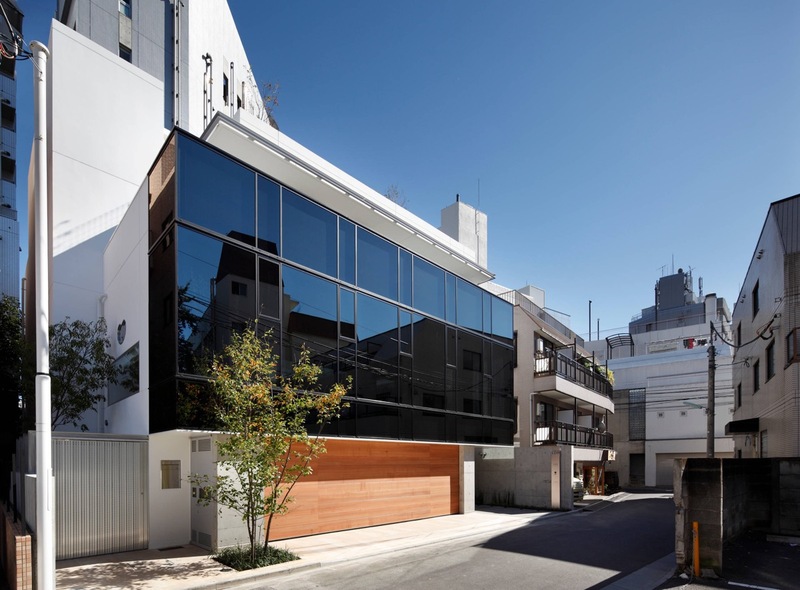 Hidden behind a black glass facade, this unique family home combines modern and traditional Japanese ideas, like a minimalist living room with an attached shoji, and a custom made cooking hearth. 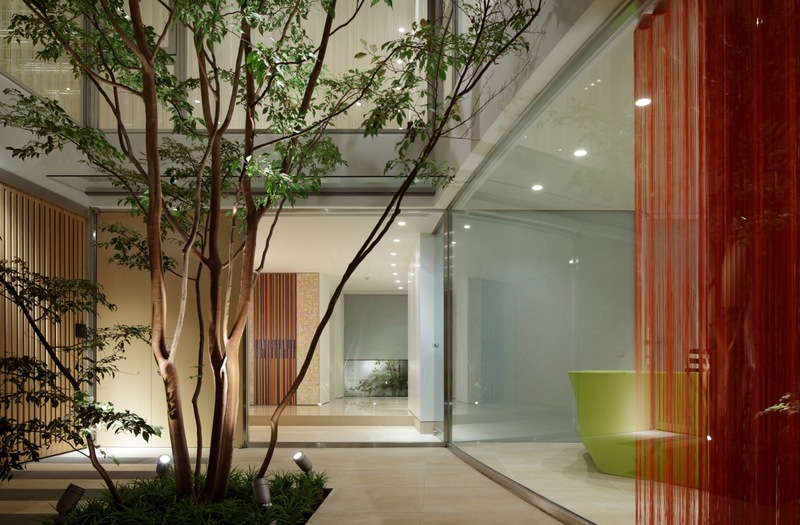 At the heart of the home, an open air patio courtyard is home to a Himeshara tree. The mature tree can be viewed from just about every room in the house, making it a part of the family. 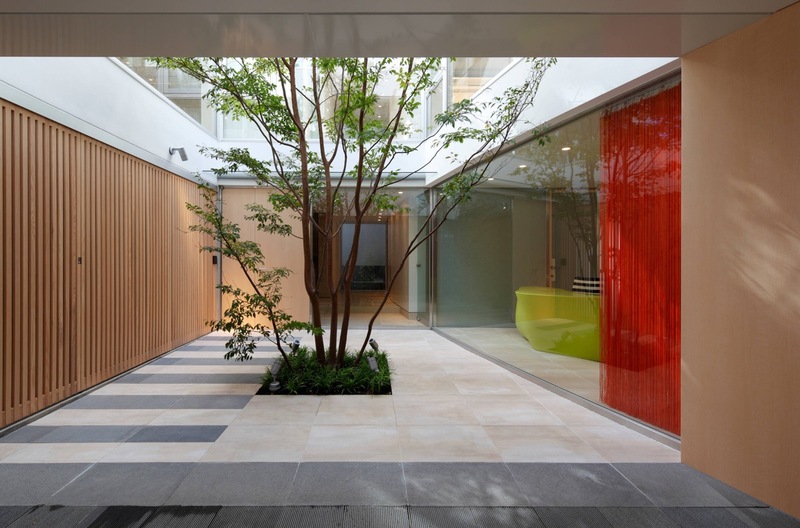 The leaves provide subtly changing decor to the interior spaces as the seasons progress and change. 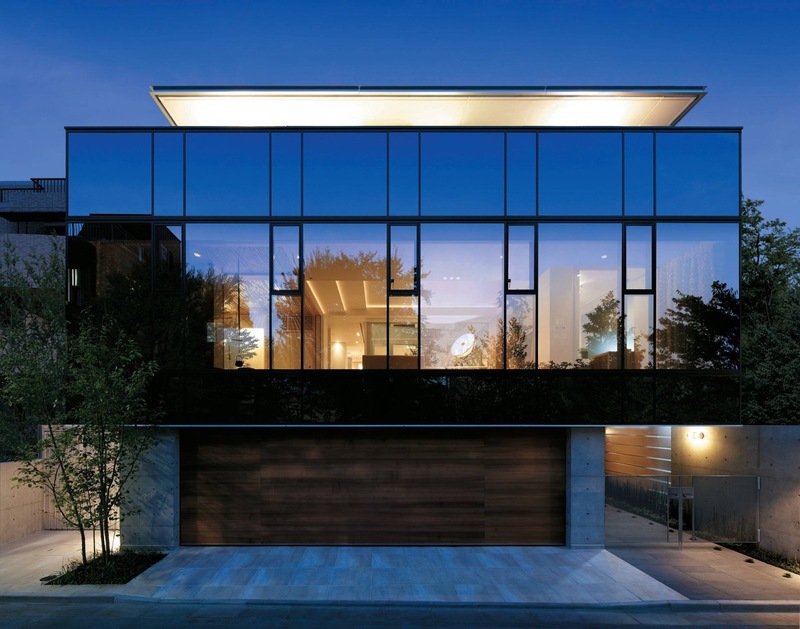 When the lights go on at night, the modern home interior is softly revealed from behind the black facade of glass. In the darkness with the eaves lit, the structure’s set back base creates a floating effect. 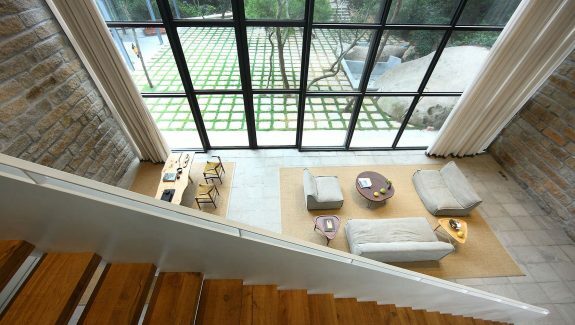 By day, the interior is screened from the world by the dark tinted glass. Closed electric roller shutter doors make the build appear like a closed fortress. 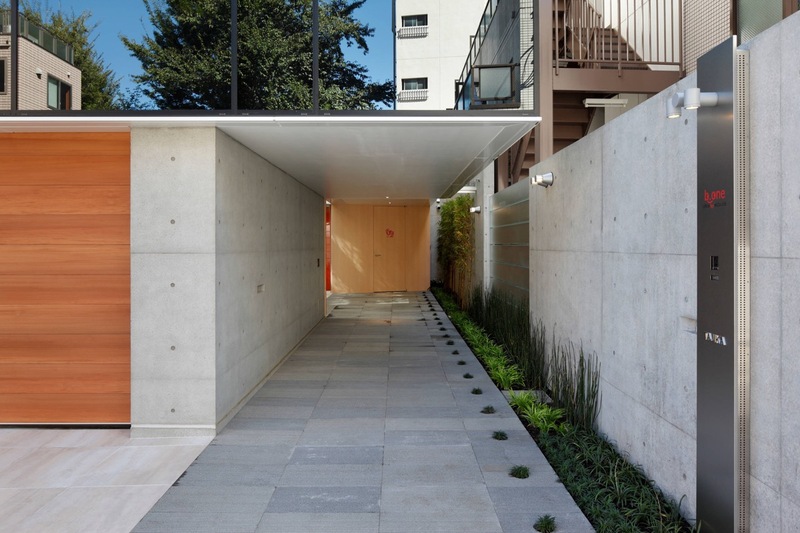 However, an entry driveway is located just to the right of the garage doors, edged in Japanese planting. 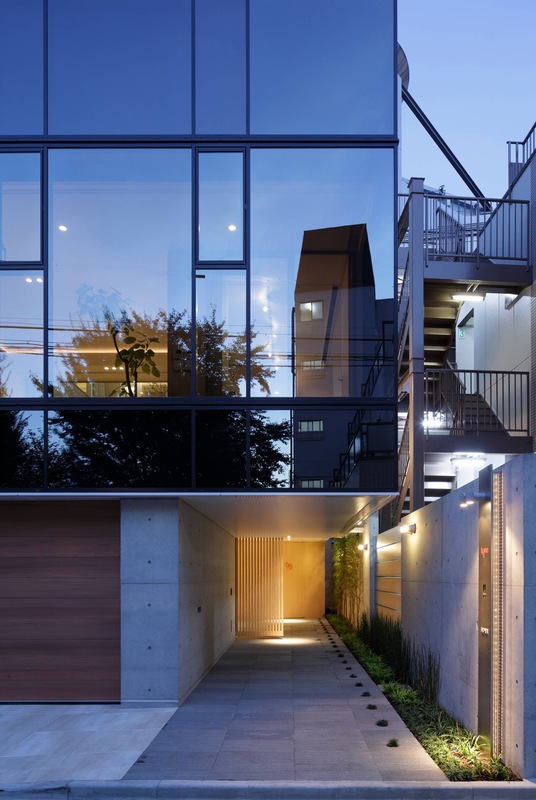 The tinted glass on the upper volume reflects a large cherry tree growing in the park on the opposite side of the street. 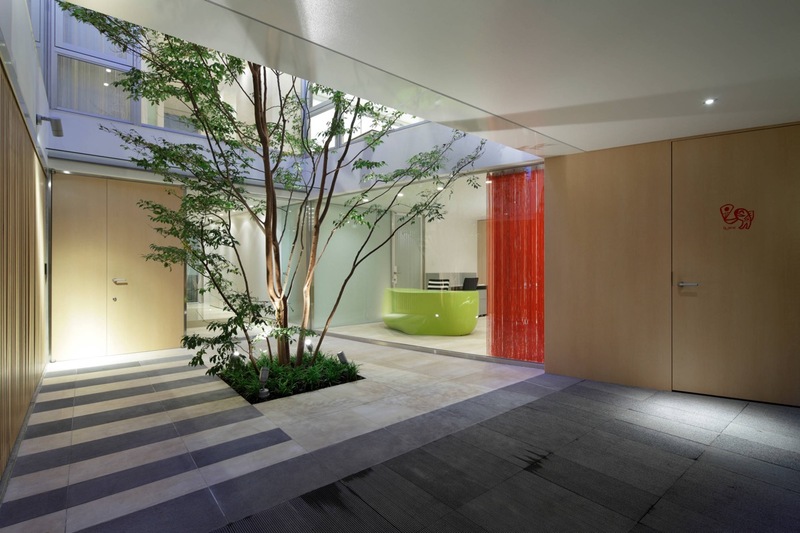 On reaching the end of the approach we find the family Himeshara tree in the centre of a patio courtyard design. The branches reach up toward the incoming sunlight from an open roof. 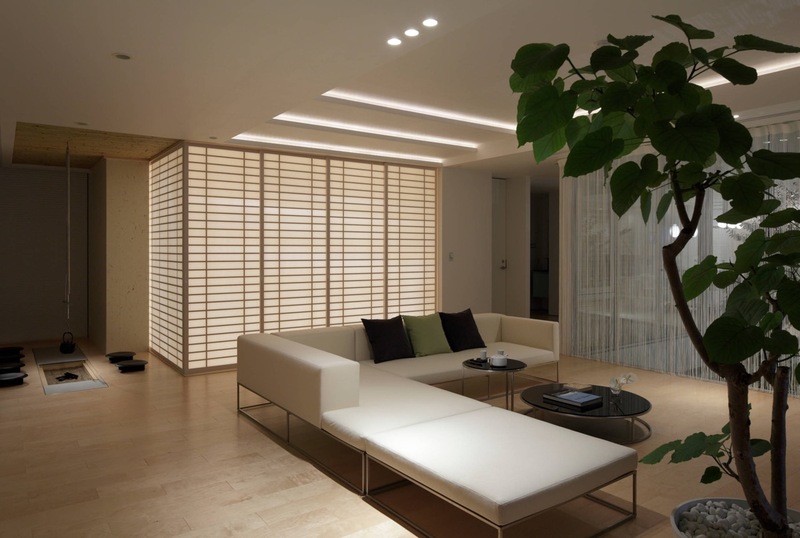 Electric window shades are installed across interior spaces for privacy. 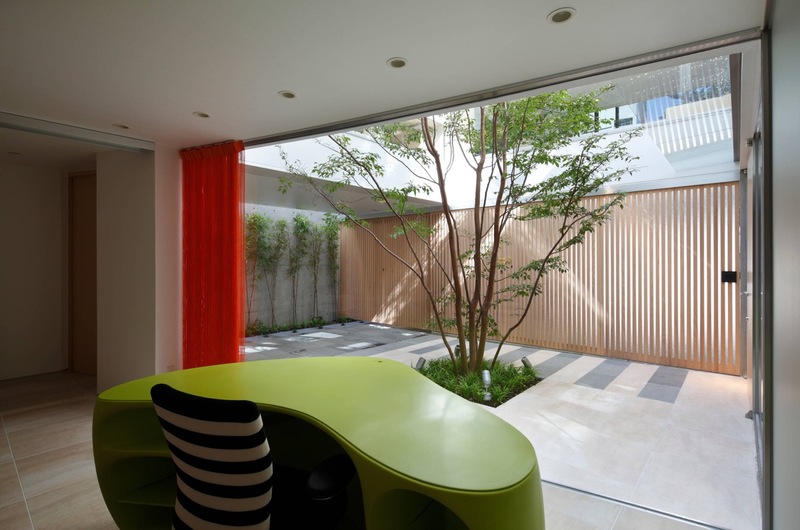 A vermillion string curtain is drawn back to reveal a home office space, which is home to a sculptural lime green desk that is faced outward to the courtyard. 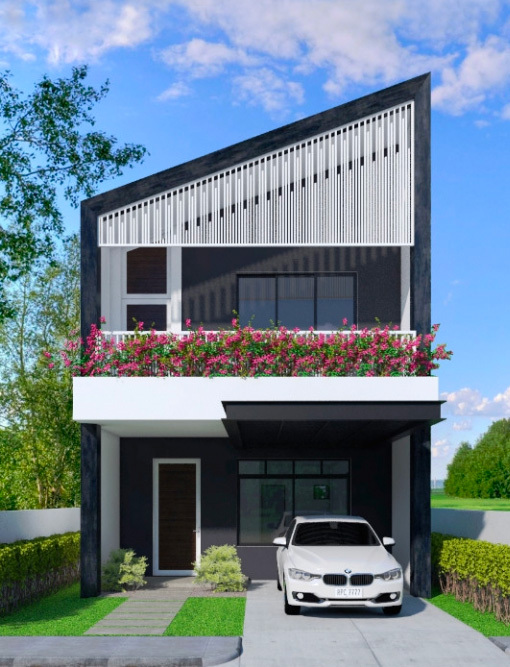 The three car garage also opens up on the courtyard side from behind a set of vertical lattice doors, which face the study. The modern home office desk looks to be the Modway Impression. A meeting table and chairs occupy the space behind. 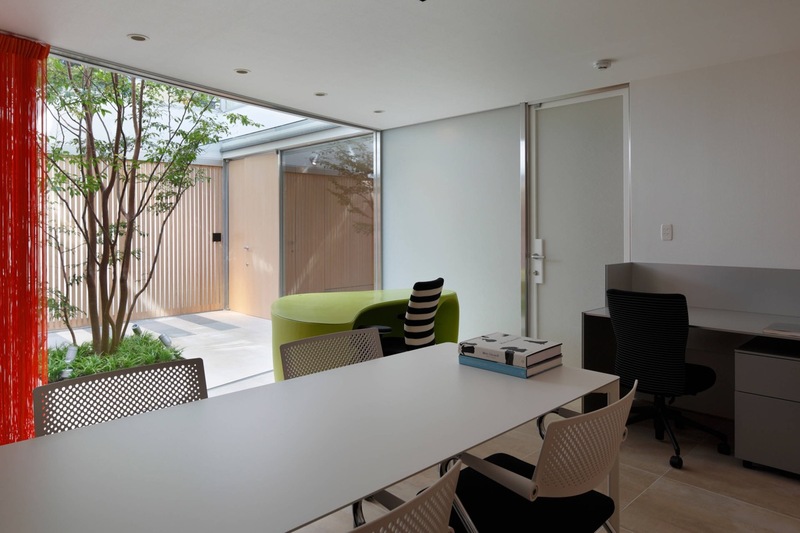 In this modern home office space the standout green desk has been paired with a striking black and white striped chair. 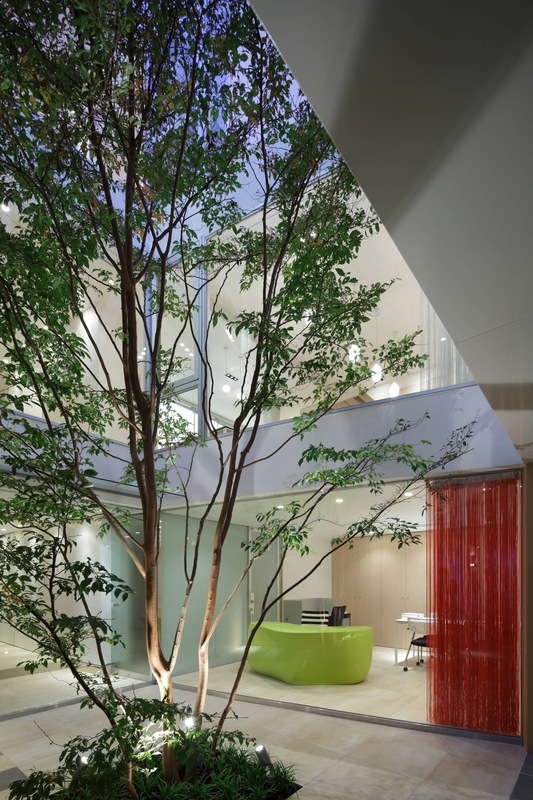 The Himeshara tree reflects over a high shine floor. 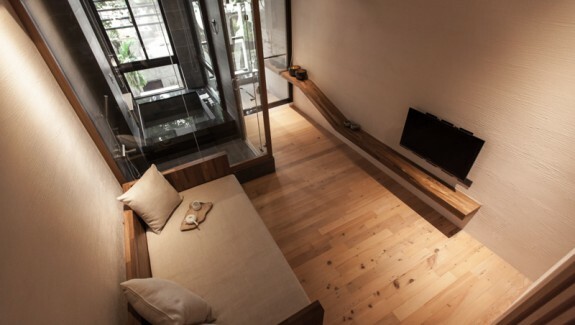 A minimalist living room is located upstairs, giving it a treetop view. 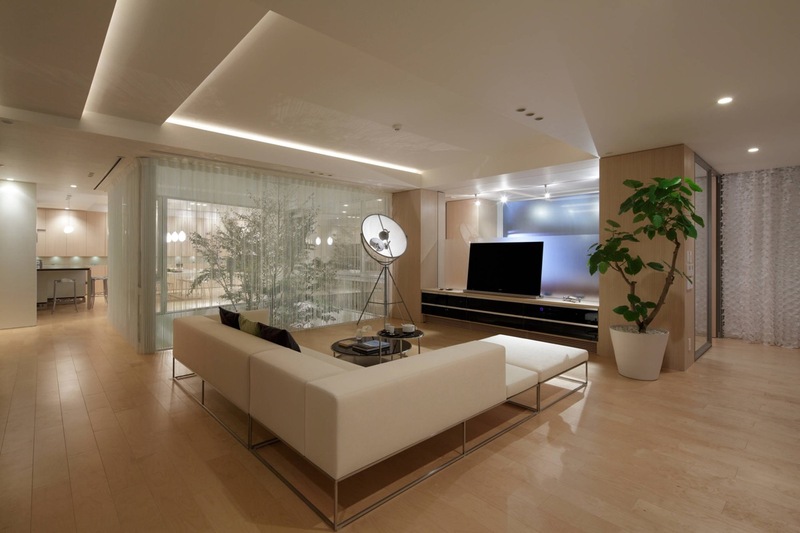 A simple linear white couch with a Japanese essence wraps the perimeter of the lounge, with a designer floor lamp marking the opposite corner by a flush fitted tv console unit. The floor lamp looks to be the super luxurious Fortuny by Mariano Fortuny for Pallucco. 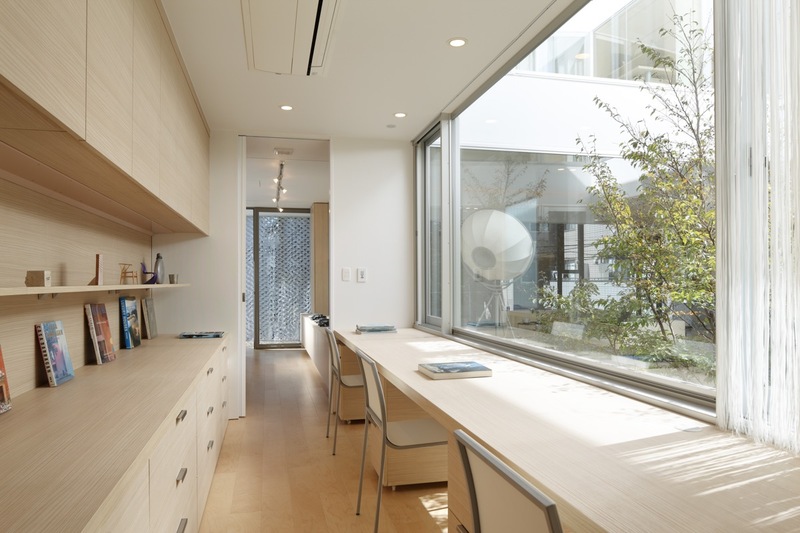 The living room takes in natural scenery on both sides, with the resident Himeshara tree on the left and a view of the park cherry blossom trees on the other side of the street. 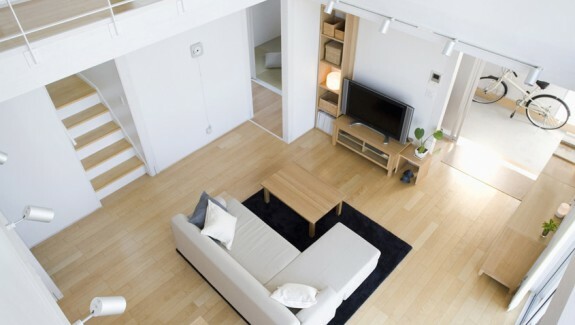 A hidden shoji is attached to the open plan living room. When closed, the traditional Japanese room is a lightbox to the lounge. 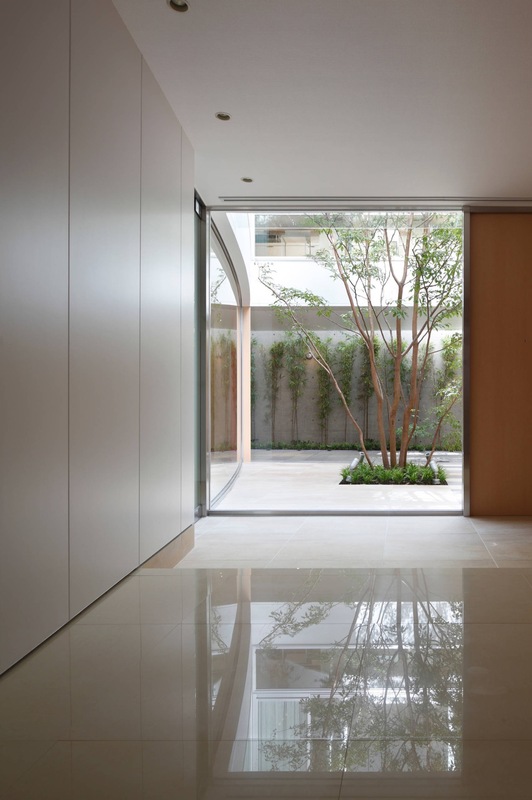 Once opened up, the shoji becomes one continuous volume with the living room. 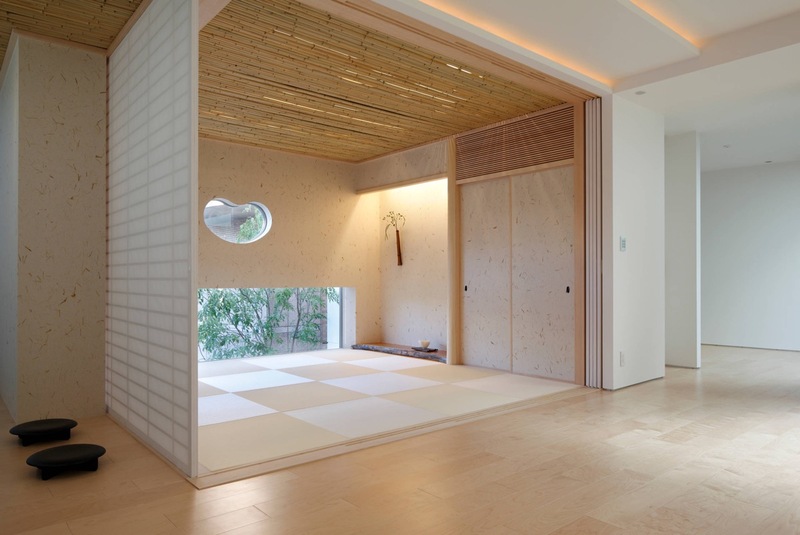 A custom designed Japanese hearth with a sliding lid is established in a neighbouring corner. 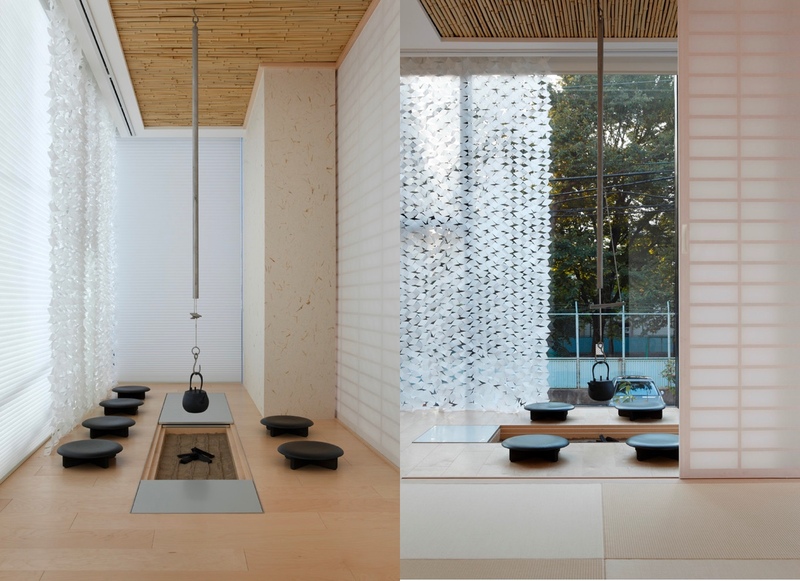 The zen inspired design features Ryukyu Tatami flooring, walls with Mino paper cross, and a ceiling of light coloured smoked bamboo that filters through gentle indirect lighting. The family enjoys hot pot dishes at the custom hearth, whilst seated on round paulownia wood stools with a natural lacquer finish, made by Kirimoto woodworks. The southern iron bottle/teapot is designed by Masayuki Kurkawa. 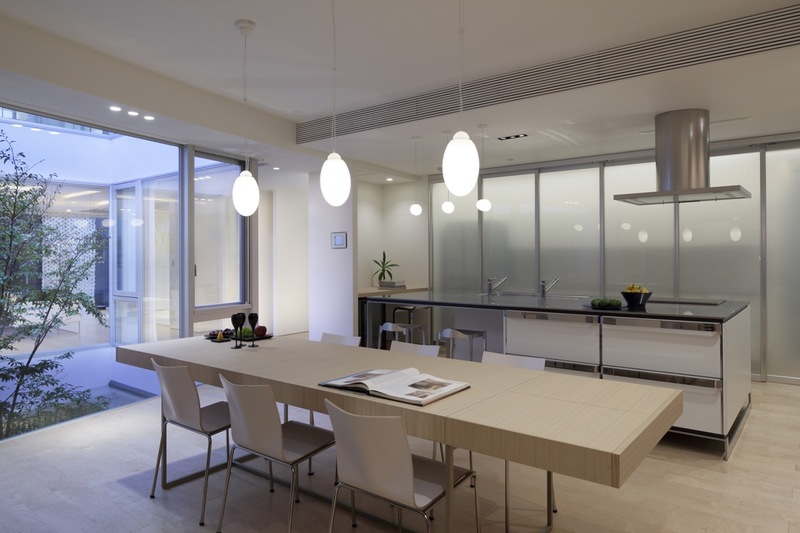 The kitchen is a sociable space where an island looks out over a large dining table. 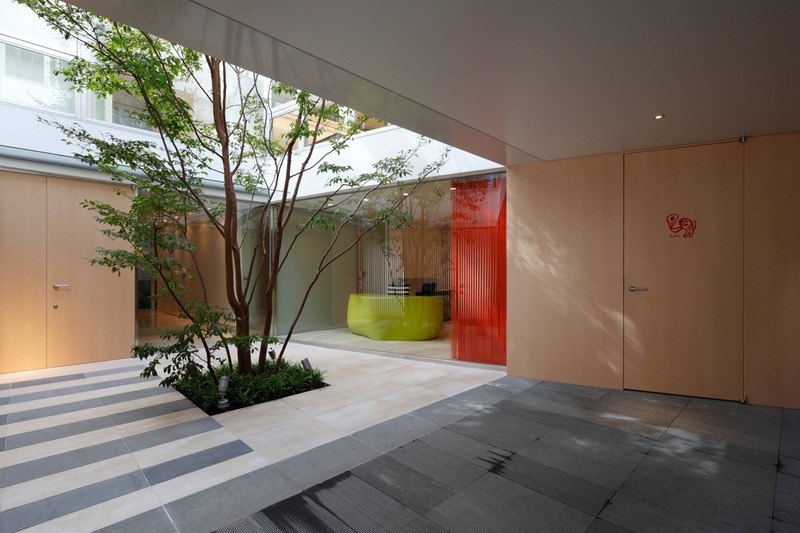 String curtains on the courtyard side obscure visibility to the rest of the home. A breakfast bar extends from one end of the central island. 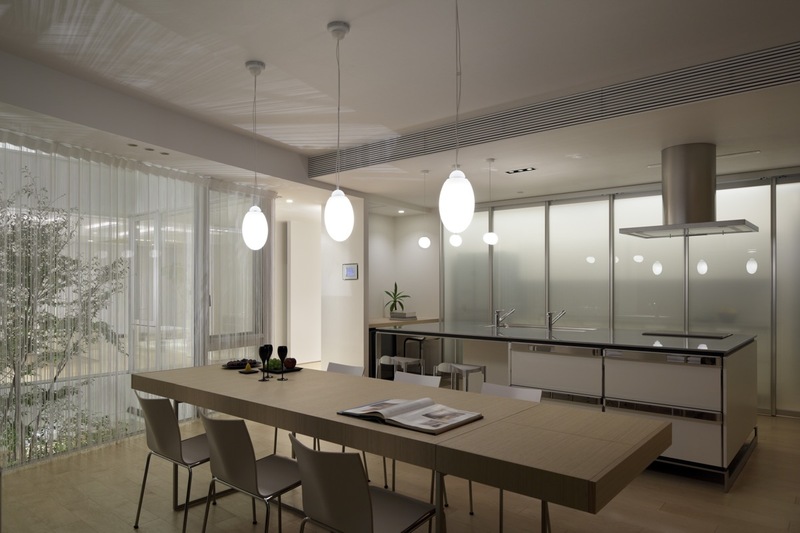 Three dining pendant lights span the length of the table. 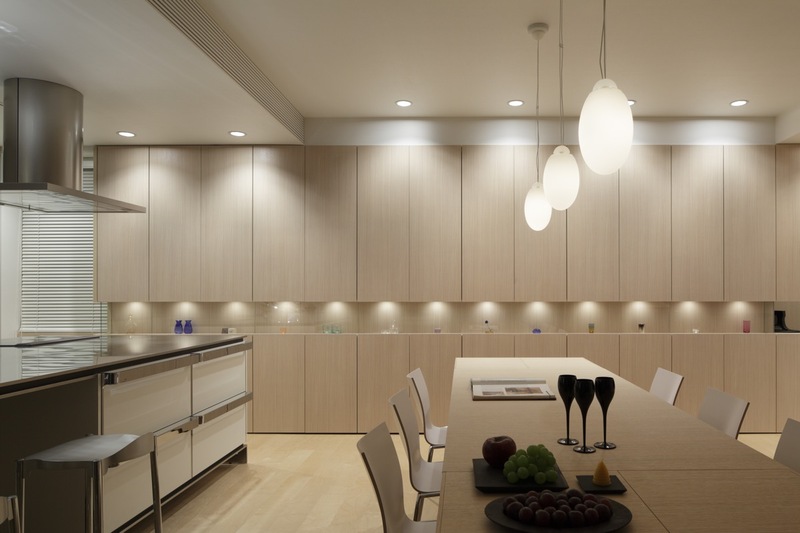 Small spotlights illuminate a display of glassware in a niche between wall and base cabinets. The other glassware and crockery are hidden away in storage cabinets. The refrigerator, microwave oven, rice cooker, toaster and other electricals are also hidden from view. 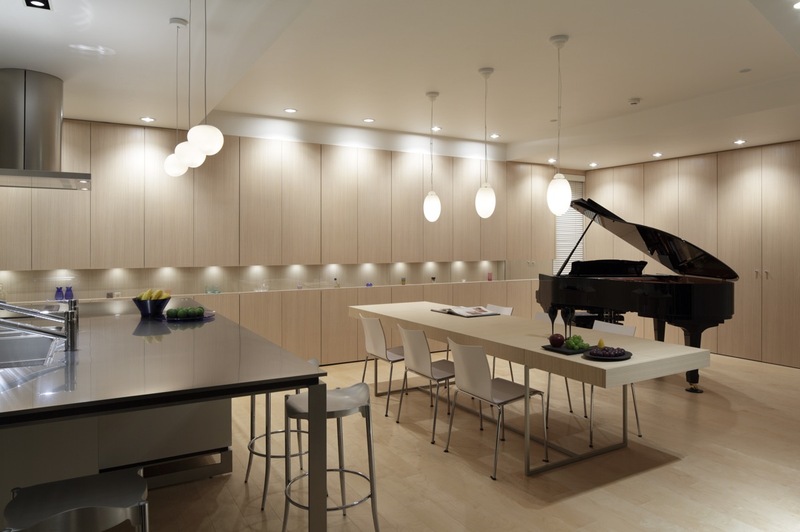 A grand piano stands poised for after dinner entertainment. A child’s study space is located behind the wall of frosted glass at the back of the living room tv set. Another kid zone resides on the third floor of the building. 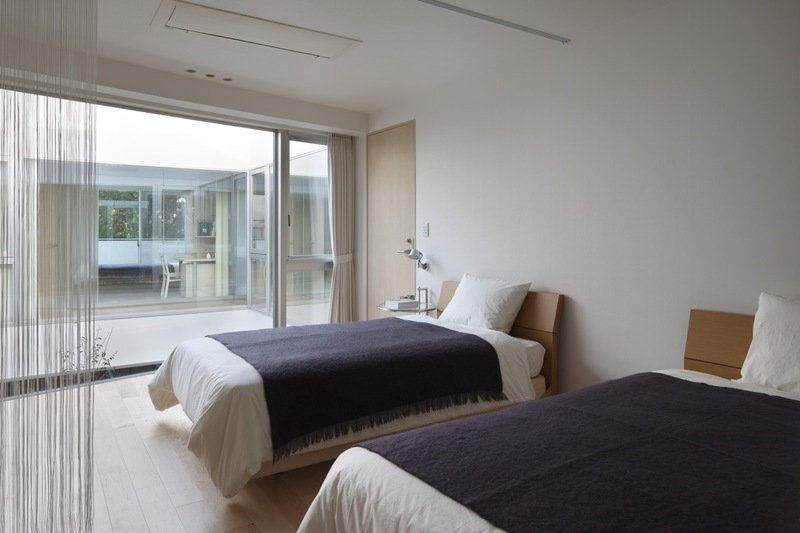 The bedrooms are bright spaces that face the courtyard. 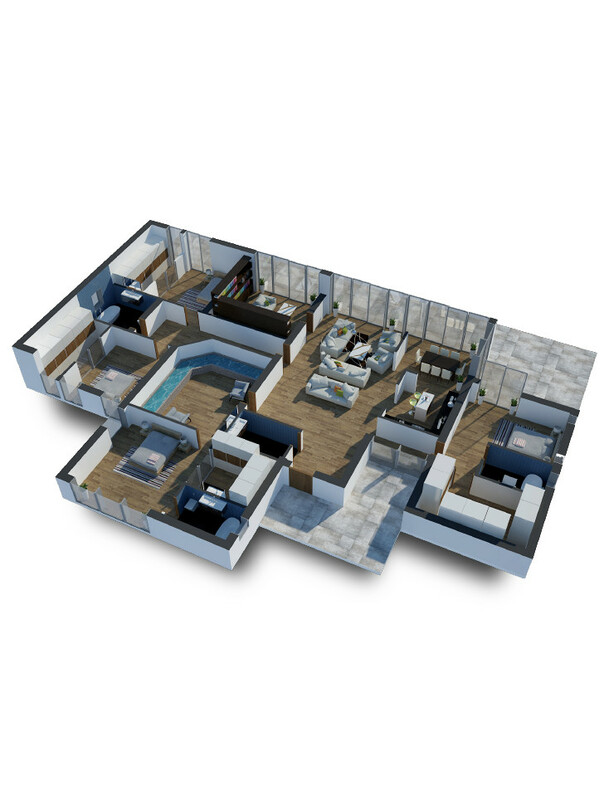 Home control is set up in the master bedroom to turn on the security alarm, air conditioner and lighting via smartphone or tablet. 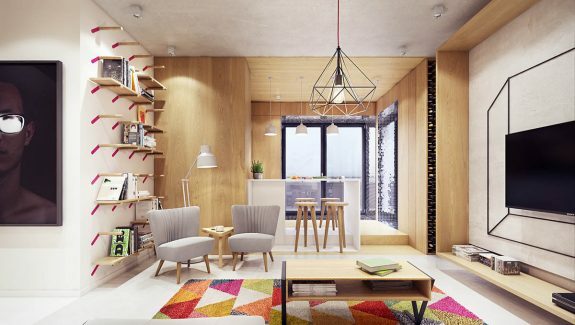 Yet another study space is provided in the child’s bedroom, in the shape of a wooden worktop and desk chair. 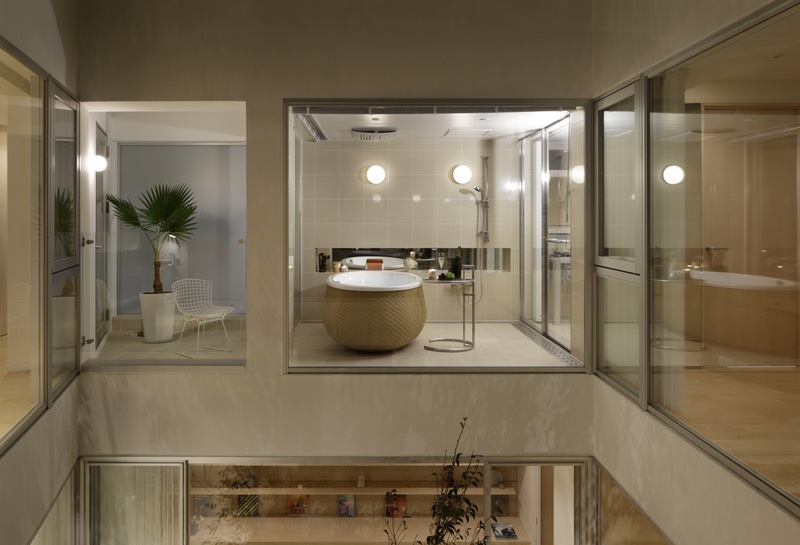 The bathroom looks down over the courtyard, with window blinds to control the privacy level. 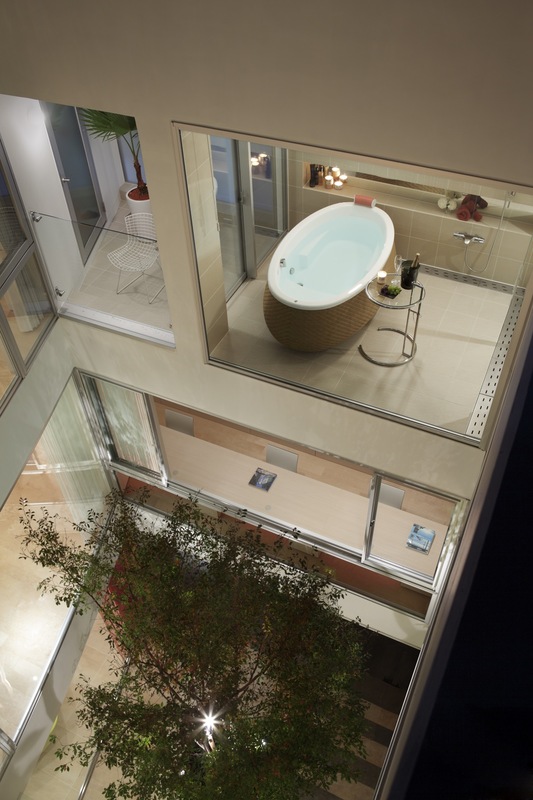 A terrace behind the bathroom brings in more greenery. The Uovo bathtub, of Jaxson’s Barca series, has been fitted with a waterproof speaker in the headboard to add music to the relaxation experience. 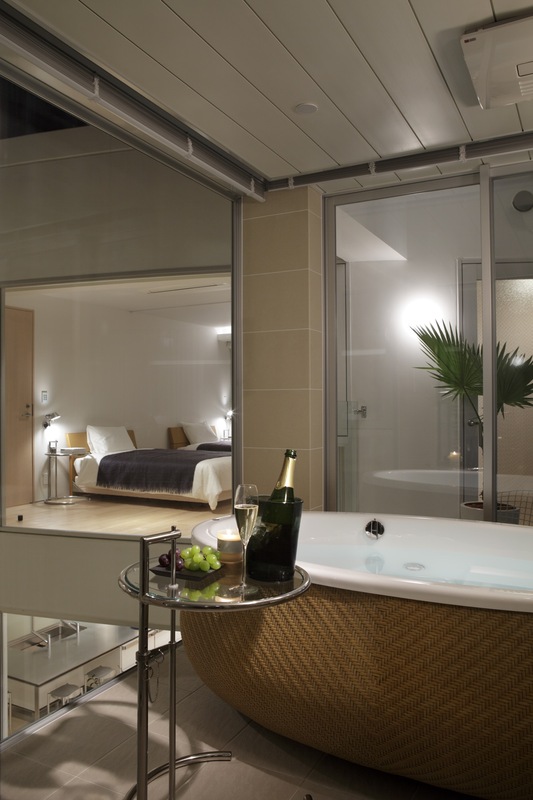 A chrome and glass side table is on hand by the bathtub to hold a chilled bottle of wine. Candlelight flickers from nearby niche. Up at the top of the home, a roof terrace is the ultimate place to unwind after a hard day’s work. 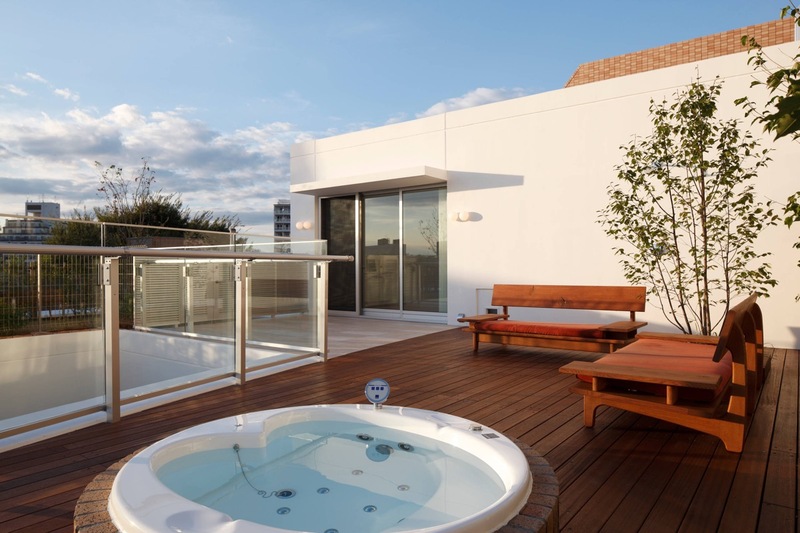 A Jaxson’s jet & blow tub is installed on the wood deck, and cushioned benches look out over the city. Mount Fuji can be seen from the rooftop during the daylight hours. By night, the jacuzzi is fitted with underwater lighting for a soft glow when relaxing under the stars.